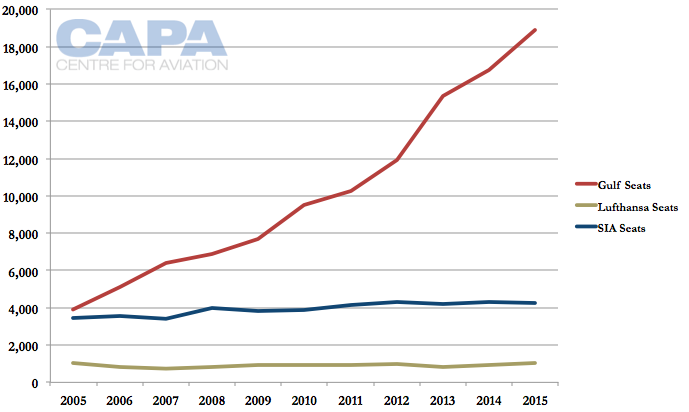 Lufthansa and Singapore Airlines have steadily been losing market share to the Gulf carriers. The two carriers have tried to use product upgrades to improve their position in the Asia-Europe market but have enlisted little help from potential partners – for example, each other. Despite their Star Alliance membership, partnership is hardly the core of their relationship. Should they – and more critically, can they? – set aside their differences to combat their greater enemy? 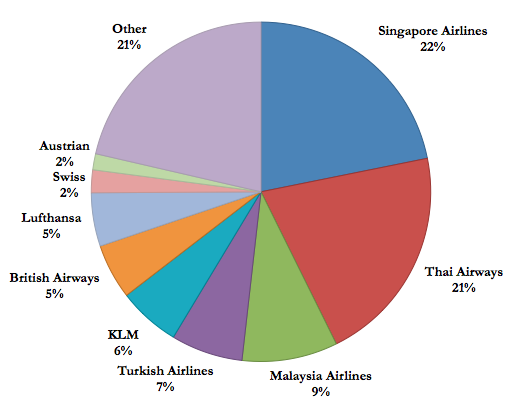 Lufthansa and SIA together account for about 27% of non-stop Southeast Asia-Western Europe seat capacity. But when also counting passengers flown through all connecting points their share of the market is only 13%, according to OAG Traffic Analyser data. Emirates alone has 12% of the market, and once Etihad and Qatar are added, 27% of passengers between Southeast Asia and Western Europe now transits with the three Gulf carriers. Since 2012, SIA has shrunk European capacity by about 1% while Lufthansa has grown Southeast Asia capacity by a modest 5%. Over the same period the Gulf carriers have expanded in Southeast Asia by about 59%. The Gulf carriers now offer 54 daily flights to Southeast Asia with connections beyond to Europe (and many other points). Lufthansa and SIA only currently offer 16 daily flights connecting Southeast Asia and Europe. A Lufthansa-SIA joint venture would be complex, but potentially productive. It is the Southeast Asian market, and not the Northeast Asian market, that has most felt the impact of Gulf carriers – largely a reflection of their respective bilateral policies. North Asia is typically more restrictive, although change is afoot. The average number of daily flights from Emirates, Etihad and Qatar between the Gulf and Southeast Asia has grown from 14 in 2005 to 54 in 2015, according to OAG data. This includes a step change in growth from 34 flights in 2012 to 44 in 2013, 48 in 2014 and then 54 in 2015. Gulf carriers meanwhile currently operate an average of only 28 daily flights to Northeast Asia. They have about 10,000 daily seats to Northeast Asia compared to about 19,000 daily seats to Southeast Asia. 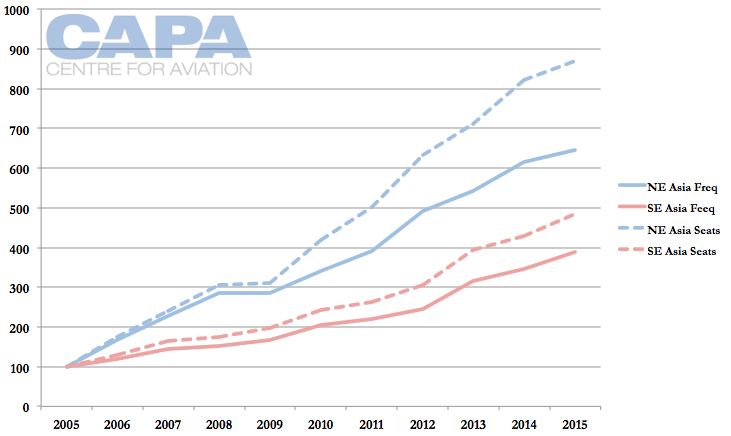 Looking at an index of Gulf carriers' seat and frequency growth into Northeast and Southeast Asia, it is evident seat growth (see chart below, dashed line for each region) has outpaced frequency growth. This is unsurprising as the Gulf carriers have taken delivery of larger aircraft – A380s and 777s – to bring greater scale to their business. Northeast Asian seat capacity has so far grown faster than Southeast Asian seat capacity relative to frequency. There are strategic explanations for this: China and Korea have heavily restricted traffic rights, forcing Gulf carriers to up-gauge instead of deploying more frequencies. Emirates flies its A380 to Beijing and Shanghai (and would like approval to do so to Guangzhou) and uses the highest density three-class A380 for Seoul Incheon. Overall, however, Southeast Asia receives higher density aircraft. In 2015, the average number of seats per Gulf flight is approximately 341 to Northeast Asia and 353 to Southeast Asia. This will likely increase further in 2016 driven by the introduction by Emirates of new 615-seat A380s to Bangkok from Dec-2015 and to Kuala Lumpur from Jan-2016. In the non-stop Southeast Asia-Western Europe market, Singapore Airlines in the leader with about 22% of seat capacity in 2015. Lufthansa has about a 5% share while Lufthansa Group carriers Swiss and Austrian each have 2%. There are a number of carriers including Air France and Finnair that have less capacity than Lufthansa but more than Swiss and Austrian. But these are included in the Other category in the graph below. But a significant portion of the Europe-Southeast Asia market travels via another region, mostly the Gulf. In terms of passengers carried for the first five months of 2015, Emirates captured a 13% share of the Europe-Southeast Asia market. Thai was slightly larger than Emirates while SIA was third with a 10% share, followed by Qatar with 9% and Etihad with 6%. The 27% market share jointly held by Emirates, Etihad and Qatar compares to the 15% held by SIA and the Lufthansa Group combined, including Austrian and Swiss. The Gulf carriers have seen their share of the market steadily increase in recent years as they have expanded rapidly in Southeast Asia by 59% while Asian and European competitors have expanded modestly or not at all. The market share from Gulf carriers is expected to continue rising. SIA is further shrinking European capacity as it introduces premium economy while Malaysia Airlines (MAS) and Thai Airways are cutting their European networks as part of broader restructurings. Gulf carriers are expected to fill the void left by MAS and Thai as they continue to expand rapidly while SIA and European carriers are still not expanding. Gulf carriers do not link Southeast Asia just with Europe. There is traffic to the Middle East, Africa and also increasingly parts of North America. Qatar Airways’ recent growth in Singapore was partially planned for a larger role in the Singapore-US market. But Europe is the single largest destination market for the Gulf carriers from Southeast Asia. OAG Traffic Analyser data for the first five months of 2015 shows that approximately two-fifths of passengers on Gulf carriers’ Southeast Asian flights connected to or from Western Europe. Gulf carriers carried slightly more passengers between Southeast Asia and Western Europe than between Southeast Asia and the Middle East. Western European traffic is less critical for Gulf carriers’ Northeast Asian flights, accounting for slightly over a third of passengers, according to OAG Traffic Analyser. This figure is skewed by a number of factors. China and Korea have heavily restricted traffic rights for Gulf carriers, which have more capacity to Bangkok alone than to all of mainland China. No doubt there is the future potential for China to be multiples of Bangkok in terms of Gulf carrier capacity. China also likely sees a more diversified traffic mixture, including a large composition going to/from Africa. Despite the circuitous routing, some European destinations are popular Gulf connecting markets from Korea and Japan as local carriers have either neglected markets (Spain and Italy, for example) or enjoy rich yields at the expense of capacity/frequency, creating an opening for competition. The Northeast Asia figure includes the large Hong Kong market, where connections to Europe are more circuitous than from Southeast Asia, but less circuitous than going from more northern markets like Japan and Korea. All other things being equal, there is more opportunity in Southeast Asia for Gulf carriers to link with Europe owing to the low routing circuity. In the tables below the non-stop (actual or theoretical if unserved) distance and the distance with a Dubai connection is measured for some of the top O&D city pairs in the Northeast Asian-Western Europe and Southeast Asia-Western Europe markets. Most of the major markets from Southeast Asia have circuity of under 10%, an exception being the Stockholm-Bangkok service. But SAS has exited the Thai market and Norwegian, while an LCC, confronts cost headwinds. In comparison, major routings from Northeast Asia to Western Europe via the Gulf have circuity over 20%. Those from more northern markets (such as Japan and Korea instead of Hong Kong) see circuity around 25%. For Gulf carriers to carve a niche in spite of arguable inefficiencies of a Middle East connection, Gulf carriers are either more competitive on price or local carriers are under-serving the market. There is a case for the latter argument in a number of markets. Neither Lufthansa nor SIA seems optimistic about the Europe-Southeast Asia market. SIA continues to warn of intensifying competition. SIA expects the introduction of a premium economy section – at the expense of regular economy seats – will reduce its exposure to the highly competitive economy market and help improve yields. Emirates, Etihad and Qatar do not offer a premium economy product. Over the next four months SIA is rolling out premium economy to five European routes, resulting in a 5% reduction in total seat capacity between Singapore and Europe. Further capacity reductions to Europe are expected in 2016 as more routes will be served with aircraft fitted with a premium economy cabin. As CAPA previously stated: "SIA in theory will carry fewer low yielding economy passengers to and from Europe, essentially ceding this traffic to Gulf carriers and other aggressive competitors." Lufthansa has unveiled plans to use Eurowings, the airline recently converted to a low(er) cost platform with long-haul services soon to be launched, to Southeast Asian markets including Bangkok. Lufthansa hopes Eurowings will enable it to serve markets it cannot do profitably on the Lufthansa cost structure, but Eurowings will focus on point to point leisure routes. Bolder moves are certainly needed. A joint venture between SIA and Lufthansa (probably also encompassing Austrian and Swiss) could deliver benefits. But would they be substantial enough, and outweigh a number of challenges? Joint ventures have so far mostly occurred in large point to point markets. SIA and Lufthansa would surely need a JV to cover not just the small Europe-Singapore market but the broader Europe-Southeast Asia market, and perhaps to Australia as well. JV airlines benefit from access to each others' hubs, and typically beyond domestic networks, in order to offer one-stop itineraries. For example, United serves Lufthansa’s Frankfurt hub from multiple US points and Lufthansa serves United hubs from a few German cities (mostly Frankfurt and Munich). In Asia, Lufthansa has an existing JV with All Nippon Airways and a planned JV with Air China. The ANA JV covers the Europe-Japan market, with Lufthansa able to tap into ANA’s Japan network beyond Osaka and Tokyo, but traffic is mostly concentrated on a handful of city pairs. This is not the case between Europe and the broad Southeast Asian market. With Air China, Lufthansa gains access to the broad Chinese domestic market, which has few other ways of being accessed. In addition, Germany-China traffic flows are large; Germany is China’s largest European trading partner. The JV proposition changes when the partner airlines are both mostly sixth freedom carriers: most of their traffic is already making one stop and the airlines are relying on access to markets other than their own. Introducing a partner and that partner’s hub means two stops. There is a precedent for this model. In 2005, Northwest and KLM offered five widebody flights between their Detroit and Amsterdam hubs – despite local traffic being only 85 passengers per day. This was the first airline JV and evolved into the SkyTeam trans-Atlantic JV. Connections beyond Detroit and Amsterdam were critical, but so too was tearing down a number of corporate culture walls between Northwest and KLM, and for some time this was a delicate experience, to say the least. The key to its success was the outcome – capturing traffic flows that the two airlines would otherwise not have achieved. While more complicated than other markets, JVs covering Southeast Asia are possible by securing approval from each Southeast Asian country. There is already a framework in place for Lufthansa and SIA to apply and secure approval for a JV covering the entire Southeast Asia-Europe market. The biggest hurdle to a SIA-Lufthansa JV is likely mindset. SIA is highly independent. While over the last four years it has added and enhanced several partnerships, including with Turkish Airlines, they appear to be making a relatively minimal contribution to its overall operation, particularly in the European market. SIA would likely need to bring SilkAir into the fold when it comes to future European partnerships. SilkAir currently codeshares with six airlines from Asia-Pacific along with other SIA Group carriers. But SilkAir is not included in any of SIA's codeshare partnerships with European carriers and is not part of the Star Alliance although SilkAir has an extensive regional network in Southeast Asia that would be of value to European carriers. SilkAir's exclusion from Star and SIA's seven European codeshare partnerships so far demonstrates SIA’s attempt to win the market on its own. SIA has kept SilkAir from codesharing with European airlines, leaving SIA to control traffic to SilkAir’s more boutique markets rather than letting a partner airline fly for part of the way and then transfer a passenger to SilkAir. Gulf carrier competition has become a way of life and a benchmark for service as well as market access. Although the airlines do not generate in Asia the high levels of major airline antagonism the way they do in Europe – and now America – there has been behind-closed-doors lobbying and subsequent questions from governments to Gulf carriers. Yet market access largely continues without problems in these naturally competitive and high growth markets. The extent of liberalisation – the UAE and Singapore have open skies – helps in Southeast Asia and hinders in Northeast Asia. Gulf carriers can only grow in the Southeast Asia market. So how to mount a competitive response? The EU and ASEAN have discussed a potential open skies agreement. The EU along with China and other countries could potentially join the soon to be implemented open skies pact within ASEAN. The EU-ASEAN proposal, which was first discussed at a summit in early 2014, is aimed at counter-balancing Gulf carriers by facilitating expansion and hence recovery of market share for European and Southeast Asian carriers. But if implemented such an agreement is unlikely to deliver major competitive benefits. Even if SIA were allowed to fly, for example, from Bangkok to Europe, it would likely find the proposition challenging without local feed in Bangkok. SIA operates some fifth freedom services, so has experience with long-haul flights from hubs other than Singapore. But these are typically in the less competitive trans-Pacific market (Europe-Asia is far more competitive as it is exposed to competition from the Gulf carriers) and SIA can rely on connections from Singapore. EU-US open skies largely failed to stimulate European airlines to offer flights outside of their home. For example, Air France's London Heathrow-Los Angeles service proved to be short lived. But an EU-ASEAN open skies agreement would make it easier – although would not be a prerequisite – for European and Southeast Asian airlines to implement potential joint ventures. A Lufthansa-SIA JV would not be a silver bullet to their problems but could help with scale if the two airlines (and their respective groups) can evolve discussions to a deal. Lufthansa is an experienced JV player, although SIA is largely new to this area. SIA currently has JVs with SAS and Air New Zealand. SAS is one of SIA's seven European partners. But SAS does not serve Singapore, limiting the value of the joint venture on the Singapore-Copenhagen route. Four of SIA's other European codeshare partners also do not serve Singapore: Aegean Airlines, Brussels Airlines, Croatia Airlines and LOT. Of SIA's 25 codeshare partners (excluding other SIA Group carriers), currently only 10 serve Singapore, an indication of how SIA prefers partners in markets that are not served by both airlines. SIA does codeshare with two Lufthansa Group carriers which serve Singapore. But the Swiss codeshare does not include the Singapore-Zurich route, which both carriers operate, and is limited to five European destinations beyond Zurich. The SIA-Lufthansa codeshare does include Singapore-Germany flights but Lufthansa only operates one daily flight to Singapore and the codeshare beyond Frankfurt is limited to about 25 short-haul routes within Europe. Trans-Atlantic connections are excluded. Beyond Singapore, Lufthansa only codeshares with SIA to Australia and New Zealand and not on any regional flights within Southeast Asia. There is clearly scope for a significantly enhanced partnership between Lufthansa and SIA. The ideal scenario is a JV, which has been discussed. The other JV option for SIA would be Turkish. The two carriers expanded their partnership in 2014 and currently codeshare on Singapore-Istanbul, which both operate, and about 30 destinations beyond Istanbul. Turkish is now SIA's third largest partner after Virgin Australia and Air New Zealand (based on number of codeshare destinations). The SIA-Turkish partnership is much more comprehensive than SIA-Lufthansa as it covers destinations in Africa, Eastern Europe and North America as well as Western Europe. But a JV has not yet come up in discussions between the two carriers and there is not an established framework for JVs in Turkey, which is not part of the EU. A JV with Lufthansa or another European carrier would not be aimed at winning back market share in the Southeast Asia-Europe market. A JV would not be able to generate the pricing necessary to compete with Gulf carriers, which typically offer fares between Southeast Asia and Europe of less than USD1000 including taxes (in some cases significantly less). SIA is content to continue to concede lower yielding economy traffic to Gulf carriers. But it has been keen to expand its partnership portfolio as it sees value in offering an expanded network to its premium passengers as well as higher yielding loyal economy class customers. New or enhanced partnerships with European carriers are inevitable – and potentially even a JV with a European carrier, which was once unthinkable but now a very plausible scenario. Finding the right balance, however, is never easy. Managing overlapping capacity is the heart of a JV’s work. That, and making the most of the potential to aggregate traffic flows at each end. But the primary and most challenging ingredient is a matching of cultures.